Here at Valley® Irrigation, our mission is to provide you with the most durable irrigation supplies in the industry. That's why the Valley gearbox is manufactured right here in the USA. We life-test each Valley gearbox before it leaves our factory and arrives in your field, giving you peace of mind that you have the most reliable gearbox available for your irrigation equipment. Large-capacity rubber diaphragm: Expands with heat and pressure to minimize water condensation. Input and output bearings: American made and case hardened to provide the highest quality and highest load rating available in the industry. Worm gear: High-strength ductile iron provides significantly longer wear life than steel when combined with a cast iron bull gear. Tooth design: Industry exclusive 25° tooth angle provides 40% longer life and better reliability in tough conditions compared to normal 14 1/2° tooth designs. Largest bull gear neck and keyway: For strength in critical load-bearing area. Expansion chamber: Cap made of corrosion-resistant cast aluminum; rubber diaphragm allows oil to expand and contract during operation. Vented cap prevents pressure buildup and prevents seals from leaking. Threaded endcap: Allows accurate bearing preload to increase bearing life. 52:1 gear ratio: Fully recessed tooth design keeps oil between engaged gears. Bull gear: High-strength cast iron provides the highest load capacity and longest life in the industry. Optional bronze gear is available for extreme conditions. Multi-viscosity gearbox oil: Exceeds 85w140 GL5 oil for long gear wear under extreme load conditions. The ultimate output torque test measures the amount of load applied to the gearbox before it breaks, simulating a stuck drive unit. 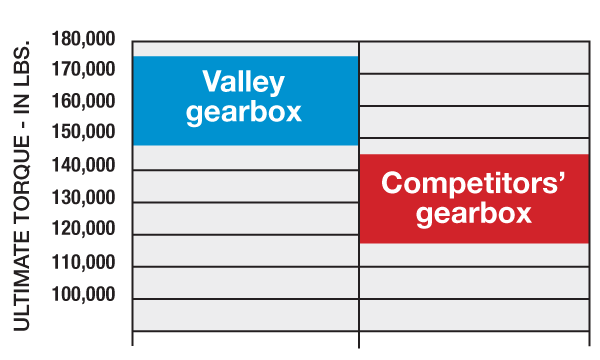 Gearboxes sold by two other center pivot companies were tested against multiple Valley gearboxes. The left axis of the chart indicates the range of loads recorded at gearbox failure. Tests were performed in a head-to-head comparison, in a controlled environment and in a standard manner to ensure an accurate comparison. The accelerated life comparison test measures the life of a gearbox, simulating a center pivot operating in difficult conditions such as in mud or high slopes. 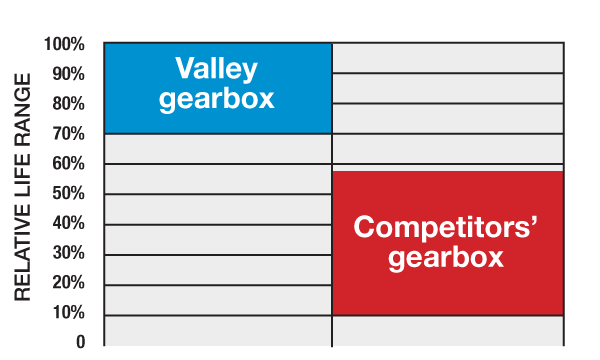 Gearboxes sold by two other center pivot companies were tested against multiple Valley gearboxes. The left axis shows the relative performance; 100% is equivalent to the best result recorded during testing. Tests were performed in a head-to-head comparison, in a controlled environment and in a standard manner to ensure an accurate comparison.